Create a Quote - Mobile – Welcome to the NextMinute support and feedback centre. In this example we are creating a blank Quote, which can then be assigned to a Task or Job. You can also create Quotes straight from a Task or Job. Step 1: From the main menu Select Quotes, Select Actions and Add. Step 2: Select to Add a Quote from the options. In this example we will create a Blank Quote. 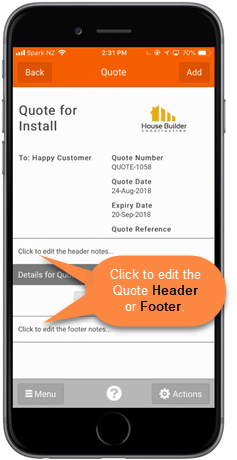 Enter the quote information in the form provided, assign a customer and Quote information. 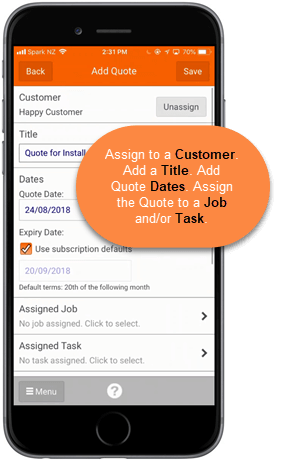 You can Edit the information as necessary, include a Quote Title, Quote Dates, Assign to a Job or Task, add a Reference and enter any Private Notes. Edit the Quote's header and footer as necessary and Add charges to the Quote by selecting Add or Add a new item. Add Labour, Materials, Disbursements and other Charges as necessary by selecting the plus sign. We have selected Labour. Select the Labour rate, enter the quantity and hit Save. Add any other Charges you need and when happy go Back to the Quote. To Preview the Quote before sending, select Actions and Hit Preview. You can then Send your Quote from the Preview view. Select a recipient from the list or hit Add Recipient, bottom right, to select a recipient from your Contacts. The default message can be edited manually, or hit Actions and select a Template, Insert Snippet or Insert Merge Fields as required. You can also Preview the message before sending. When happy hit Send. The Customer or Client can Accept or Reject the Quote via the email they receive (see Quote Acceptance). You can also go back into the Quote, select Actions and scroll to Accept/Reject. We have selected to Accept the Quote and Yes to confirm. When the Quote has been Accepted it will have an Accepted flag next to it, as shown below in the Quotes List.